MyMemories Blog: Today's Daily Designer....Mag's Graphics! 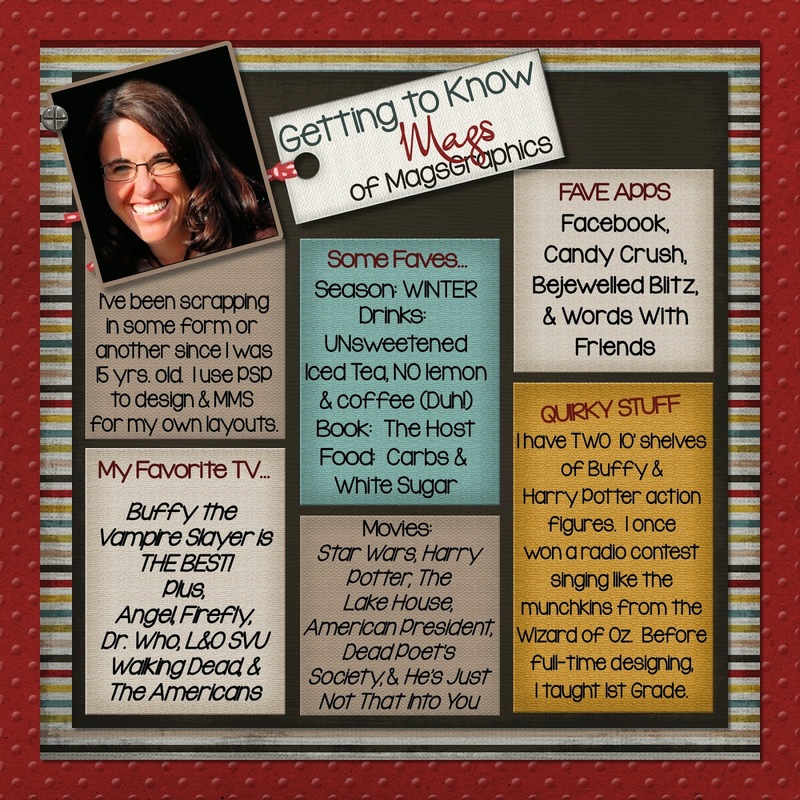 I'm Maggie Buckley of MagsGraphics. I answer to Mags, Maggie, Mom or "Maggie Is Awesome," "Darth Magius," or "Magius Malfoy." *wink* I am a former 1st grade teacher turned stay-at-home Mom of 2 boys. Now that my kids are in middle school, I design full-time. I've been scrapbooking in some form or another since I was 15 years old (I'm 41 now!). My very first albums used construction paper and (gasp!) Elmer's Glue (Yikes!). When I discovered Creative Memories, I ripped apart the old albums and re-did them with acid-free materials. I converted to digital in 2007 and haven't looked back. LOVE digital!! I'm a total geek and Buffy the Vampire Slayer addict. I just started watching Dr. Who (um... last week) and am already on Season 4 (binge, much?!). Right now, I'm most pleased with the Faith365 Series of kits I've created this year. This faith-based project includes monthly collections released around the 15th of each month. So far, I've done "Choose Joy," "Fruit of the Spirit," "Faith, Hope, & Love," "Risen," and "Joyful Noise." This project is my best work so far! 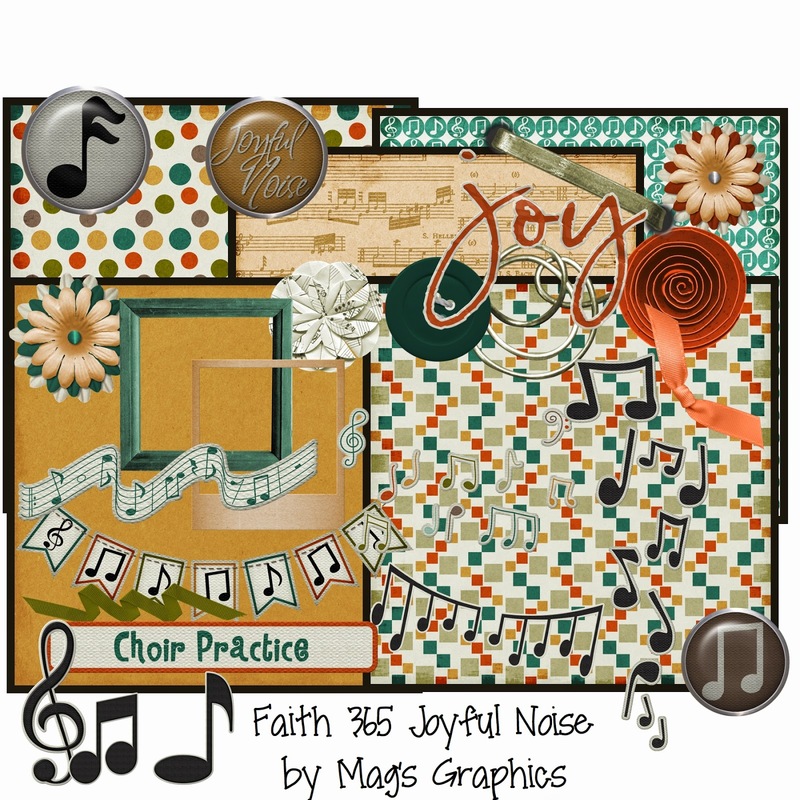 Here is her Thursday Collection Connection using the Faith365 Series: Joyful Noise! Head over to Mag's Graphic's Design Shop to enjoy 40% OFF!